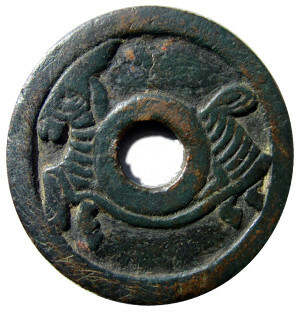 Horse coins (ma qian 马钱) originated in China during the Song Dynasty (宋朝 960 – 1279). They were not used as money, however, but as game pieces. There are a great variety of horse coins. Some display only a horse while others show both a horse and rider. Some horse coins have inscriptions which identify the horse or rider. The horses were famous for their speed and endurance. Some are referred to as a “thousand-li horse” (qian li ma 千里马) which means the horse could travel 1,000 li (里), or about 400 km, in a single day. Even though the Chinese began using armour for their war horses as early as the end of the Han Dynasty (汉朝 206 BC – 220 AD), very few horse coins depict a horse wearing armour. At the left is a rare example of a horse coin with the horse wearing the type of armour (铠甲马) used by the Chinese during the Song Dynasty. The horse is shown in a full gallop. Another distinctive feature of this Song Dynasty horse coin is that it shows the saddle. Very few horse coins display the saddle due to the placement of the square hole in the middle. The obverse side of this horse coin is particularly attractive because the inscription is written in seal script (zhuan shu 篆书). The inscription reads long ju zhi ma (龙驹之马) which translates as “Dragon’s Colt”. Dragon’s Colt was one of the famous horses owned by Emperor Wen (202 – 172 BC) of the Han Dynasty. At the left is a very rare horse coin that recently appeared in a Chinese coin forum. 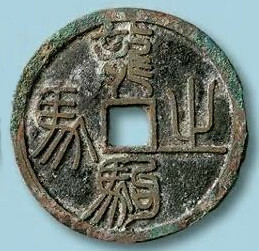 The horse coin is identified as being from the Yuan Dynasty (元朝 1271 – 1368). The Yuan Dynasty followed the Song Dynasty. The Yuan Dynasty was ruled by the Mongols and was founded by Kublai Khan (元世祖). 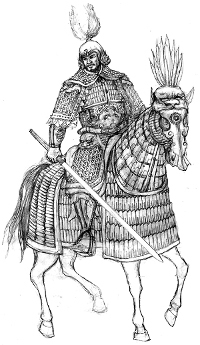 The Mongols rode horses wearing battle armour during military campaigns which helped them to create the largest contiguous land empire in history. The Mongol Empire (1206 – 1368), under the leadership of Genghis Khan (成吉思汗), stretched from central Europe to China. This horse coin displays a horse in full gallop wearing the armour typically used by the Mongols. 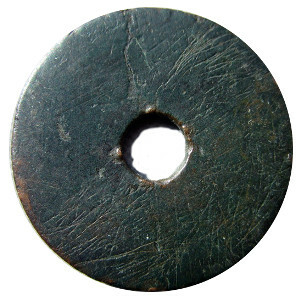 Unlike the Song Dynasty horse coin shown above, this coin’s hole is round instead of square. The hole, unfortunately, prevents us from viewing the saddle. As best as can be determined, this Yuan Dynasty horse coin does not appear in any Chinese numismatic reference book. The reverse side of the horse coin is shown at the left. It is flat with no inscription. 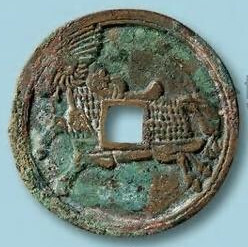 This is in contrast to Song Dynasty horse coins which almost always have an inscription or design on the reverse side. As already mentioned, these two horse coins are most unusual. Very few Song Dynasty horse coins display a horse wearing battle armour and it is rare to find any horse coin from that period which also shows the saddle. Horse coins dating from the Yuan Dynasty, particularly ones displaying horse armour, are even rarer and have yet to be properly researched.